Efficient. Organized. Innovative. Resilient. Responsive. Flexible. Competitive. 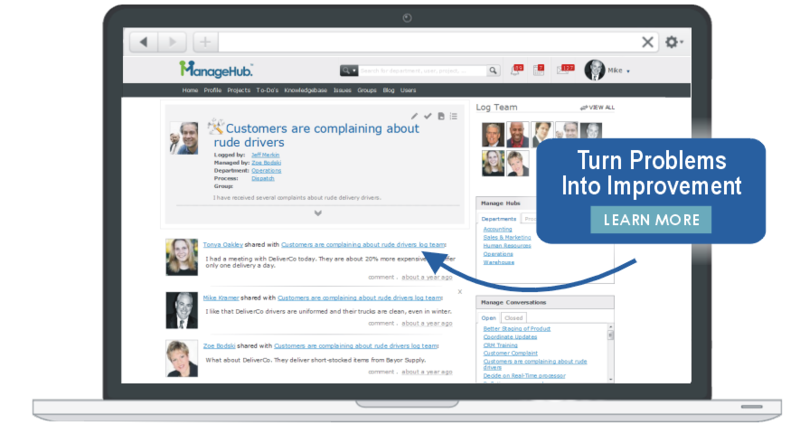 ManageHub is like having a "mission control center" for your business. ManageHub helps you build a solid and systematic business that is more sustainable, scaleable and successful. It works by organizing your people into online collaboration workspaces where everyone works together to document critical organizational knowledge, report and resolve issues, share valuable ideas, implement improvement projects, and manage your organization's critical strategies. ManageHub is the only platform that combines project management, issues resolution, a suggestion system, and knowledge-base into one integrated management platform. 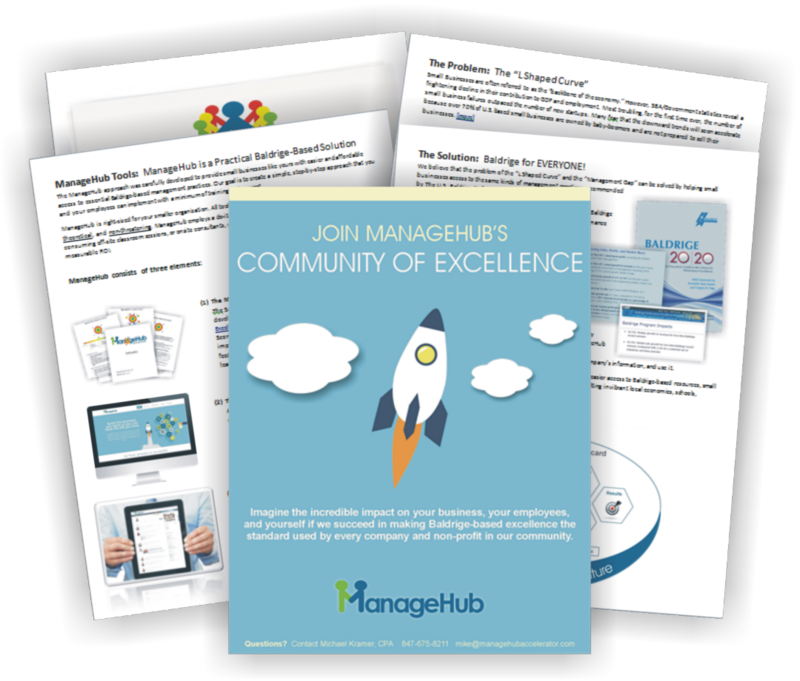 ManageHub helps you reduce the risk, stress, and disorganization of growing your company by helping you adopt the same kinds of management practices used by the most successful companies to grow, innovate, and outperform their competitors. Unlock the incredible potential of your people. Your employees are your most valuable resource. They are your organization's eyes and ears. They know what is working and what is broken. They speak with your customers. They perform your operational processes. You need to know what they know as soon as they know it. 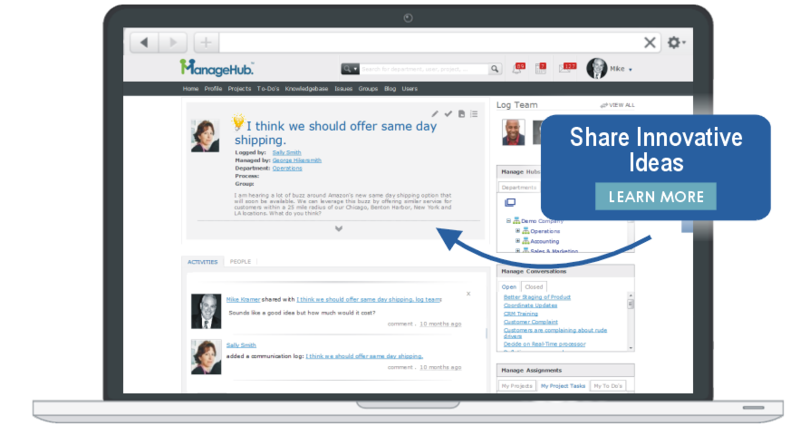 With one click ManageHub allows your people to share vital operational knowledge, report an issue or share an idea for improving your company. Their information and insights are immediately communicated to the appropriate departments, processes, and strategic teams. 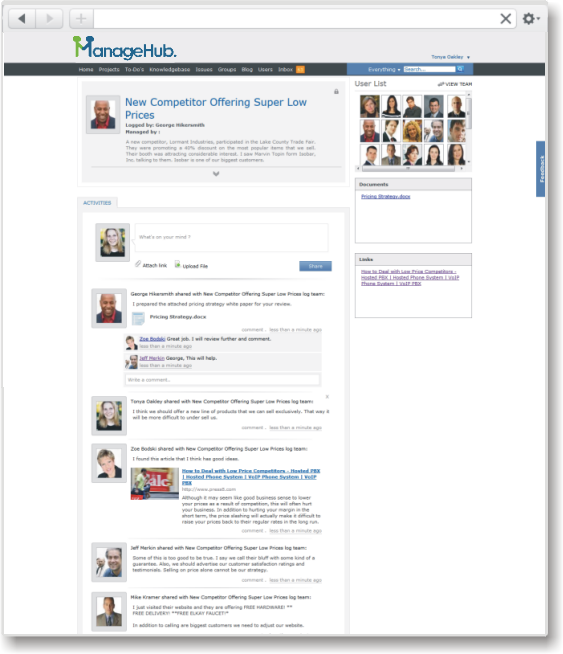 Your people can then work together, online using one of ManageHub's collaborative workspaces. When needed, a project or assignment can be automatically created to help manage an agreed upon solution. Once knowledge is shared, an issue is resolved or an idea is implemented the discussion and any related projects or assignments become part of your organization's searchable historical archive for future reference. 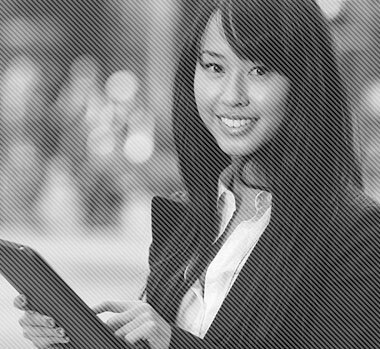 Bring your strategic plans to life and help maximize your company's success. 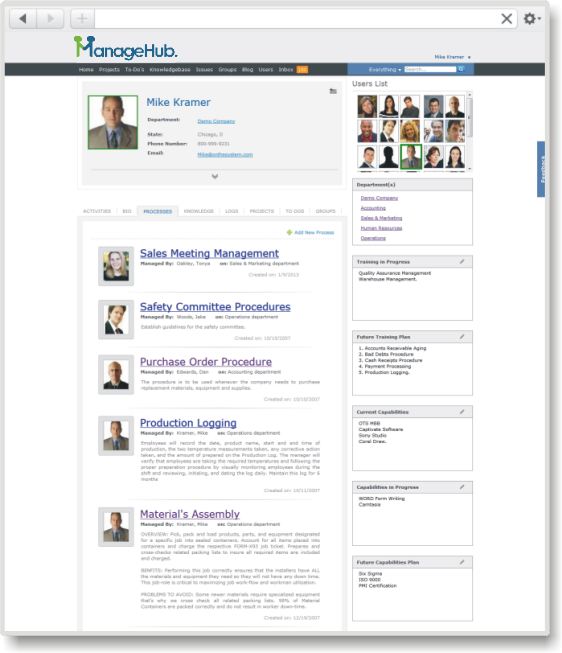 ManageHub helps you create a highly responsive, flat organizational structure that is managed by a network of teams. Each team is empowered to manage their knowledge, projects, processes, and collaboration with independence. At the same time supervisors can monitor each team's progress with complete accountability and transparency. 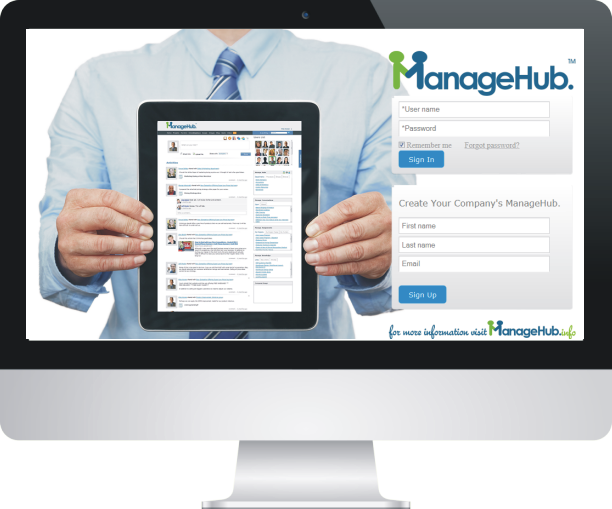 ManageHub allows you to manage your organization your way. You and your employees can create an unlimited number of collaborative workspaces and configure them to meet the specific operational and strategic needs of your business. Organize Your People into a "Network of Teams"
Learn how ManageHub can help you easily unlock the communication, collaboration, and creativity in your organization. 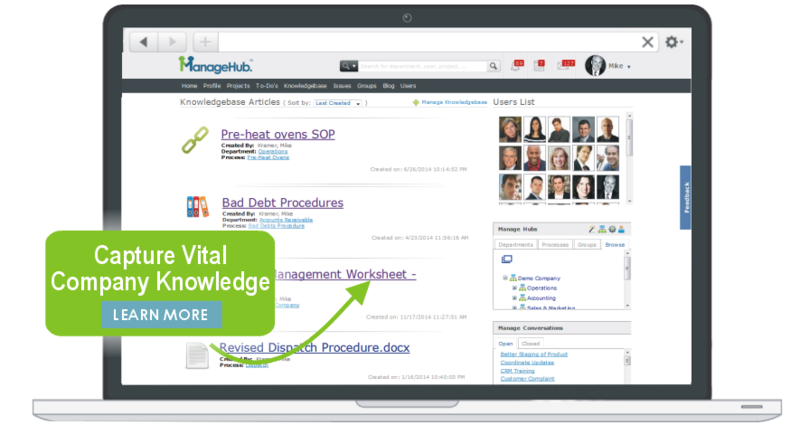 Use ManageHub Software to create a highly organized, innovative, productive, and profitable business. Instead of talking about all the things you should be doing, use ManageHub to engage your employees in improving, optimizing, and achieving the results you want. 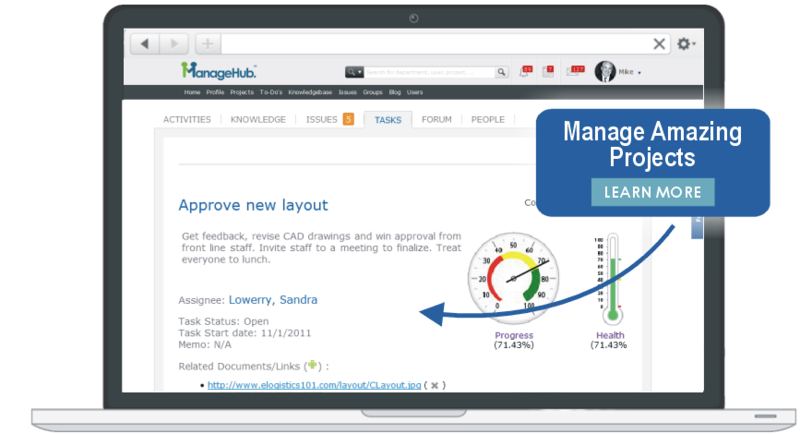 ManageHub software works by organizing your people into self-managed teams who learn how to document, improve, and manage the work they perform. 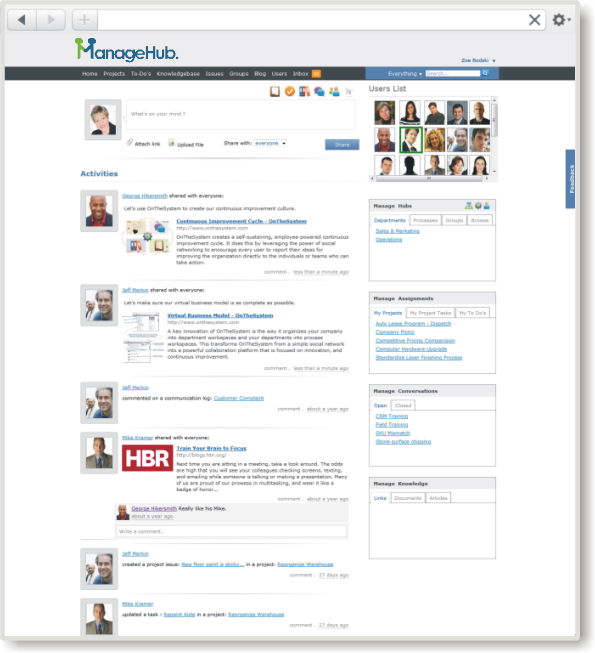 ManageHub makes everyone a leader in your company, with accountability and transparency. 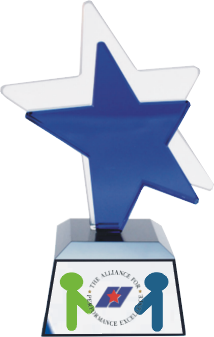 Control all "the moving parts"
Manage with one "company way"
Baldrige is recognized as the world's gold-standard of business excellence. It has a proven track record of helping businesses increase sales, quality, customer satisfaction, employee engagement, and profitability. 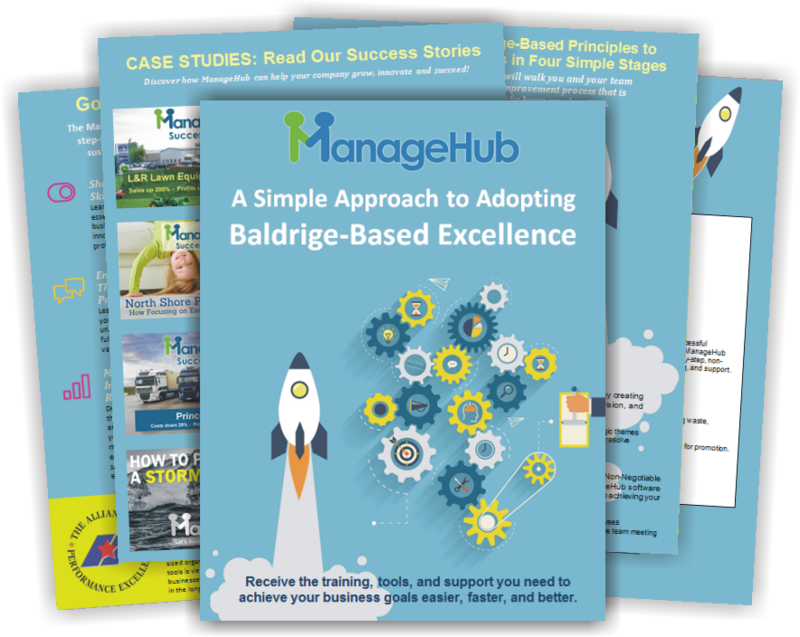 ManageHub offer you the tools, training and support you need to start adopting the Baldrige Performance Excellence Framework in your business. Optimize your company's security program with on-demand access to online tools, training and support, so you can gradually (or rapidly) improve your information security program. 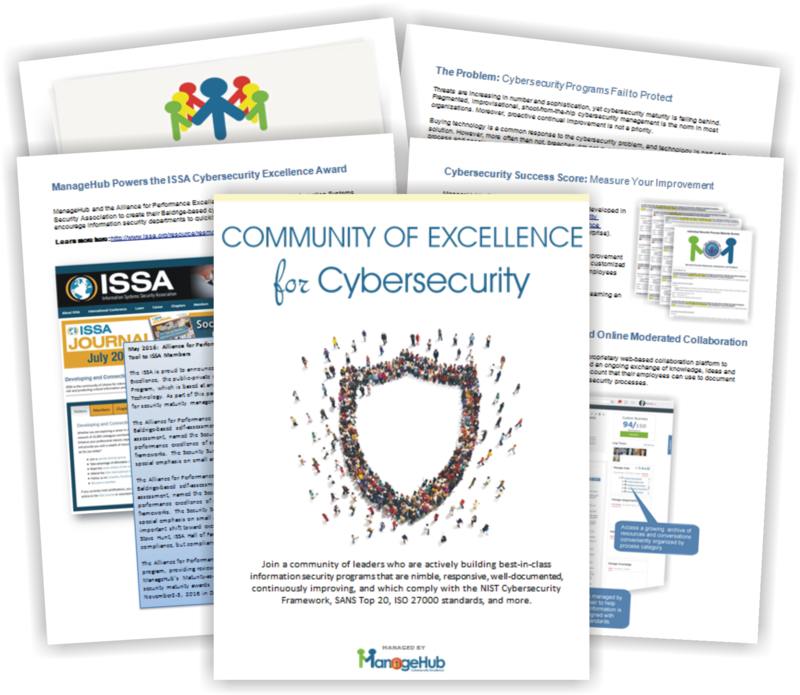 Our mission is to dramatically improve the efficiency and effectiveness of your company's cybersecurity program by helping you adopt the same practices used by the largest and most successful information security departments. ManageHub and our cyber professionals help demystify complex and confusing cybersecurity requirements and terminology. Together, we help you make decisions, select technologies and choose the best options for your business. CMMI-live helps you replace the time and expense of after-the-fact Class B and Class C appraisals with ongoing, online review of your CMMI processes and artifacts as they are created. 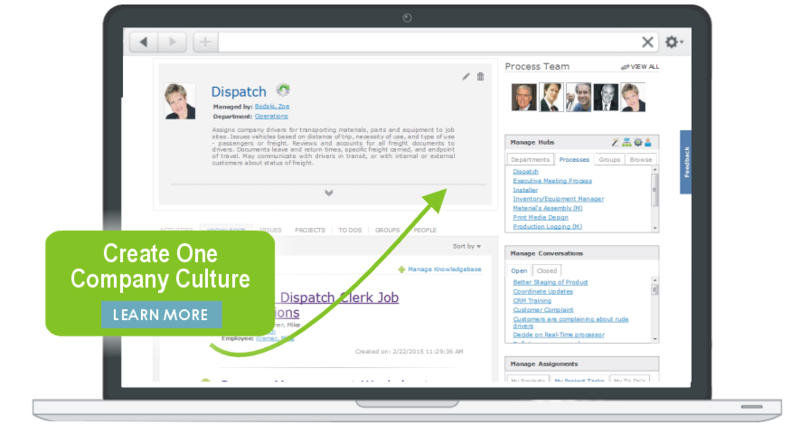 This remote, asynchronous collaboration speeds your CMMI implementation by helping your employee learn-by-doing. 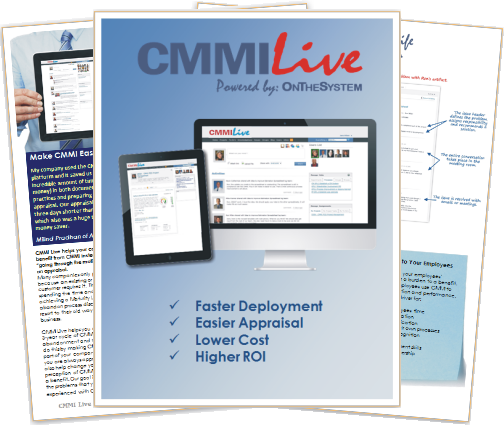 Your CMMI-Live platform comes equipped with a Level-3 compliant Process Asset Library. Automatically creates your PIID as your employees create, review, and approve artifacts. 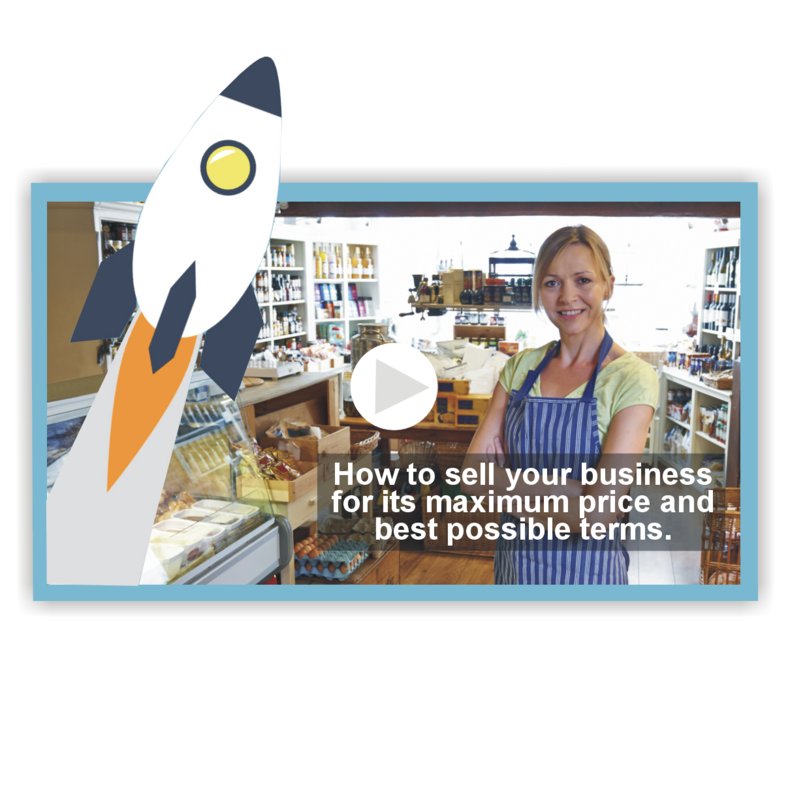 Use ManageHub Software to "Package" Your Company Like a Gift for Your Prospective Buyers. Use ManageHub to strengthen your negotiating position, justify your selling price, and avoid deal-breaking terms like unreasonably high escrows and long-term earn-outs. Use ManageHub to create a "living" operating manual and strategic plan that gives your prospective buyers assurance that they are buying a well documented, easy to operate, and strategically positioned business. Your goal is for prospective buyers to appreciate all of the value that you created and to feel confident that they can grow your company without you. 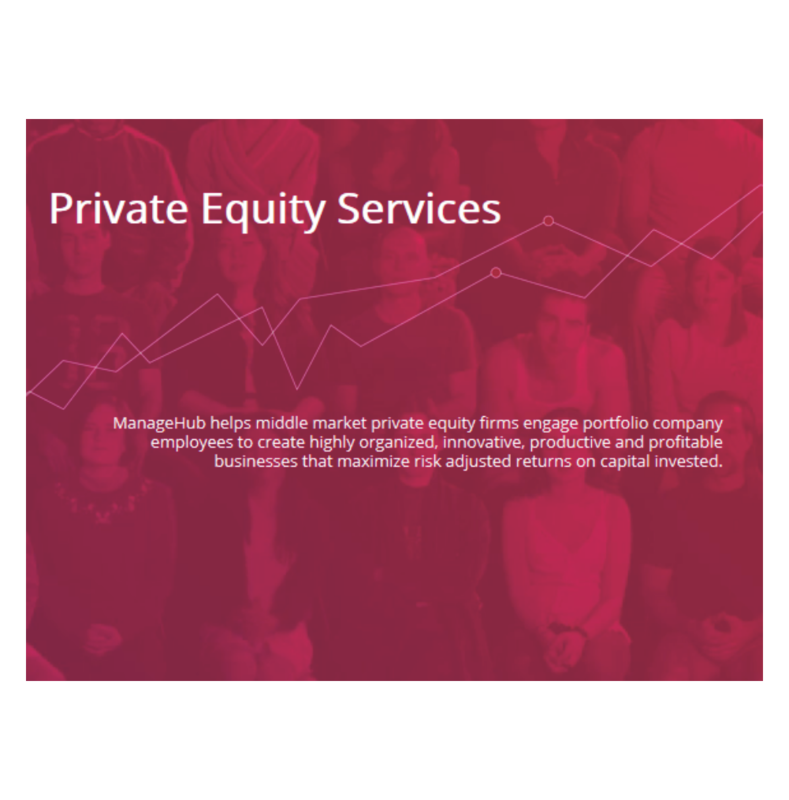 ManageHub helps middle market private equity firms engage portfolio company employees to create highly organized, innovative, productive and profitable businesses that maximize risk adjusted returns on capital invested. ManageHub offers you the tools, dashboard and employee-engagement services you need to manage everything from strategy in the board room down to measuring performance in the stock room. 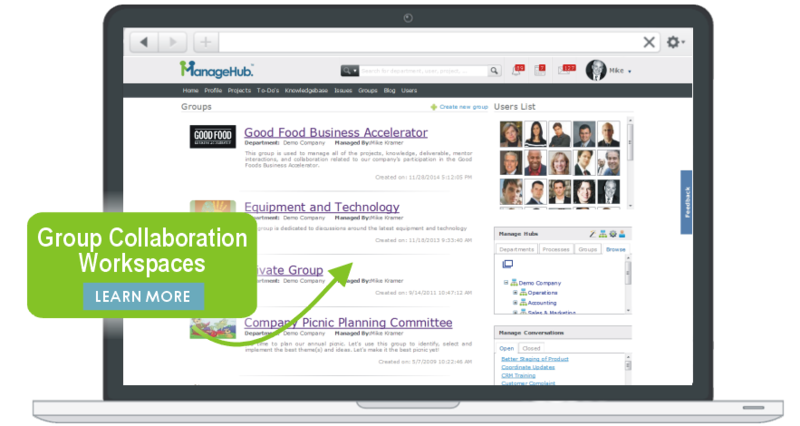 ManageHub assists operating partners to optimize the management of their portfolio companies. Our objective is to help you drive excellence, profitability and higher returns. We do this by providing your portfolio companies with a sustainable, scaleable, and systematic performance management framework..
Community of Excellence is the ultimate team building opportunity where your objective is to actually engage your employees in improving your company and achieving its strategic objectives. Our Baldrige-based approach is non-technical, non-theoretical, and non-threatening. Your employees may not even realize they are adopting critical Baldrige-based management practices. They will simply be doing the "right things" like documenting organizational knowledge, reporting and resolving issues, sharing ideas for improvement, planning and implementing your organization's strategies, etc. ManageHub empowers your employees to become full partners in the growth, development and continuous improvement of your business. Use ManageHub to document and organize your critical operational know-how, helping your business become more sustainable, scaleable, and saleable. Accelerate the sales growth and value of your company by creating a systematic sales processes that is owned and controlled by your businesses and not individual salespeople. ManageHub helps you engage your employees and stakeholders in developing and managing a set of defined and aligned strategic initiatives that are monitored and adjusted to help produce desired results. 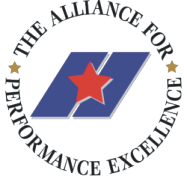 Motivate and measure the performance of your managers and employees by pursuing a prestigious Baldrige-based Award from the Alliance for Performance Excellence (for organizational achievement) and the ISSA (for cybersecurity maturity). Measure our improvement and results using key performance indicators related to five essential Baldrige-based management dimensions: Leadership, Strategy, Customer, Workforce, and Operations. Are You Ready to Start Accelerating? Fill out the form to receive your free starter kit and ManageHub Accelerator updates.